John Wayne, the "Duke" turned down the significant role of an iconic marshall in the western classic favorite TV show beginning in the 1950's, Gunsmoke. Being James Arness' senior by about 16 years, Wayne felt that the young Arness would fit the starring part for the upcoming Dodge City show as US Marshall. The rest is history! Both men were born on May 26th, Wayne, 1907 and Arness, 1923. It's amazing how life can be enhanced by going back to some of the old TV shows to pick up some motivation for living the good life...and avoiding the bad. I've never been much of a movie watcher but do like to glean great ideas form producers who reflect and help shape great character. 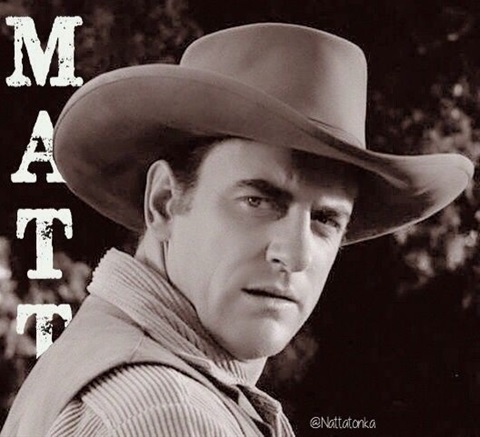 One of my favorite early Gunsmoke scenes was near the end of "Kangaroo" ("Why Christianity is Bad") in which Matt quoted a line from Micah 6:8 "...to do justly, and to love mercy, and to walk humbly with thy God", to a religious fanatic who had ordered Chester's hand to be chopped off in a fit of what he considered justice. Dad (born the same year 3 days after Arness' birth) told me at a young age as he saw my spirituality developing that "brethren would sometimes be your worst enemies". Sorry, but I found that Christianity has taken on a distorted meaning from what Jesus intended. Paschal realized this and stated, "Men never do evil so completely and cheerfully as when they do it from religious conviction". Christianity, to me is a demonstration of the oneness intended from the beginning by God and prayed for by Jesus just before his death. It is "life in the Son". Matt got the part and influenced millions. If the title of this edit post sounds familiar the three words are the words of the premier episode "Matt Gets It"...meaning, he got the bullet! Thank you Marshall Dillon for inspiring us to seek truth, mercy and justice. I've, (like portrayed in the, "Why Christianity is Bad" episode) experienced first-hand injustice at the hand of "believers" who might do better watching this episode than watching the reruns of Sunday plays. Thank you, James. Happy birthday annivesary. You, being dead yet speak wisdom and inspiration as we see you brought to life in Dodge City.